Bartow Ford is excited to announce is 25th Annual Drive for Excellence program! Advocating Excellence in education, this program is for juniors and seniors in Polk County who achieve A’s, B’s, or have perfect attendance. 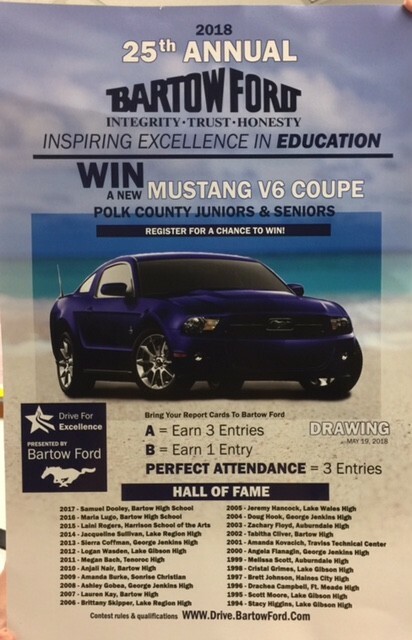 Bring your report cards to Bartow Ford to be entered to win a Mustang V6 Coupe – every A is worth 3 entries, every B is worth 1 entry, and perfect attendance is worth 3 entries. Keep striving for academic excellence, Bloodhounds! A representative from The American Musical and Dramatic Academy in NYC, will be on campus November 2nd, during 6th period, with auditions for interested Juniors and Seniors, immediately following the presentation. If you are interested, please sign up outside of College & Career and see Mrs. Weber or Mrs. Cook for more information. Congratulations to our A-Team, who finished 4th place yesterday at their site! Wednesday, Sept. 27, 2017, the Florida Department of Education will observe Dads Take Your Child to School Day statewide. This initiative is a wonderful opportunity for dads or other male role models to get involved in their child’s education, and to highlight the significant difference they can make by taking a more active role. 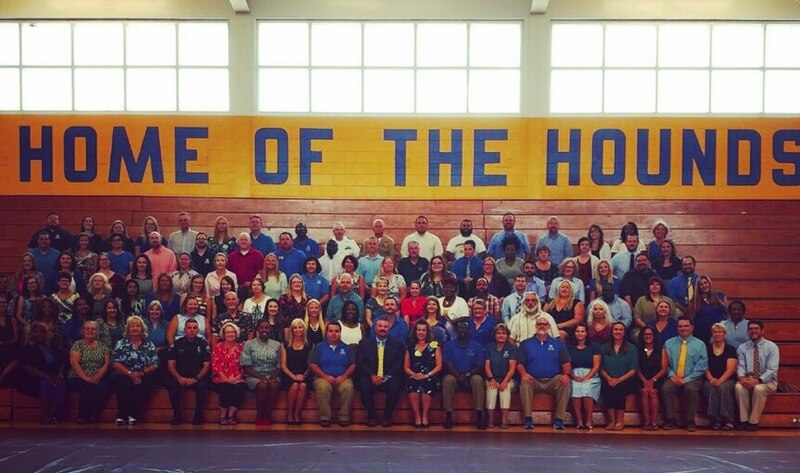 Polk County Public Schools is proud to participate in the statewide initiative. We are inviting fathers, stepfathers, grandfathers, uncles, brothers, foster fathers, mentors and other significant role models to take their children to school on Sept. 27. Mothers and other family members are welcome to participate, as we know they play a vital role in their children’s education, too. The school district created a promotional video with Kathleen High’s Ernest Joe and posted it to Facebook (https://goo.gl/CuKaZw). You can use our local hashtag, #PolkDadsAtSchoolDay, to share your photos with us on social media. Congratulations to senior Brandon Collins, who is among a select group of students who will perform at the National Association for Music Education‘s (NAfME) 2017 All-National Honor Ensembles. More than 600 music students nationwide — representing the “best of the best” — have been chosen to perform at the event, NAfME said. Brandon will join the All-National Concert Band on tenor saxophone. 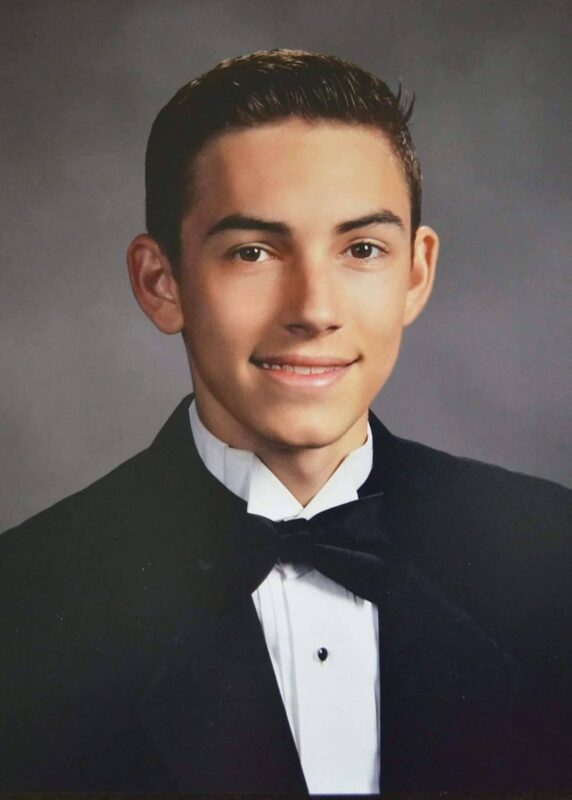 He is the only student from Polk County and one of just 11 Florida students on the roster. The 2017 All-National Honor Ensembles will be held Nov. 26-29 at Disney’s Coronado Springs Resort. We are excited to share that the college admissions rep visits have been rescheduled! All presentations will take place in College & Career. Students who are interested in attending, must sign up, but attendance will be at your teacher’s discretion. If you have questions, please see Mrs. Cook.